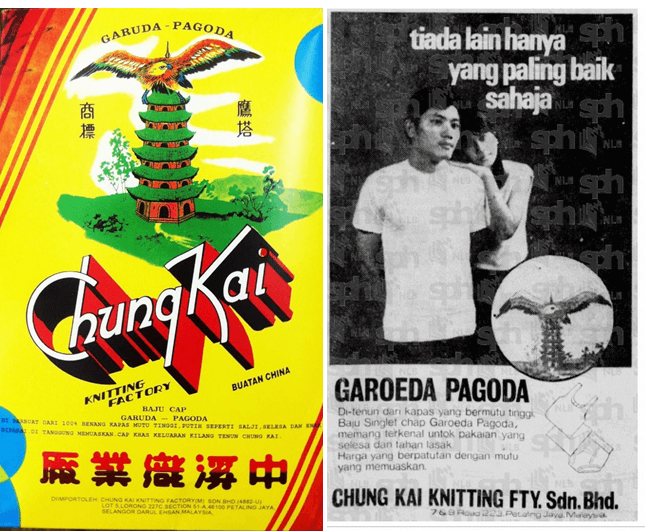 Chung Kai Knitting Factory, best known for its Eagle Pagoda (鷹塔牌) singlets, was a major player in the HK garment industry from the 1930s to 1960s before shifting its focus and production to Malaysia. Its founder Lun Chak-sum (倫澤森, 1905-1976) was a native of Zhaoqing in Guangdong province and started working in the garment trade at the age of 15 as a bookkeeper for a dyestuff shop in his hometown. He came to HK at the age of 20 where he first worked at the sewing department of Fook Tai and later served as a collector for Mien Wha Thread Co. 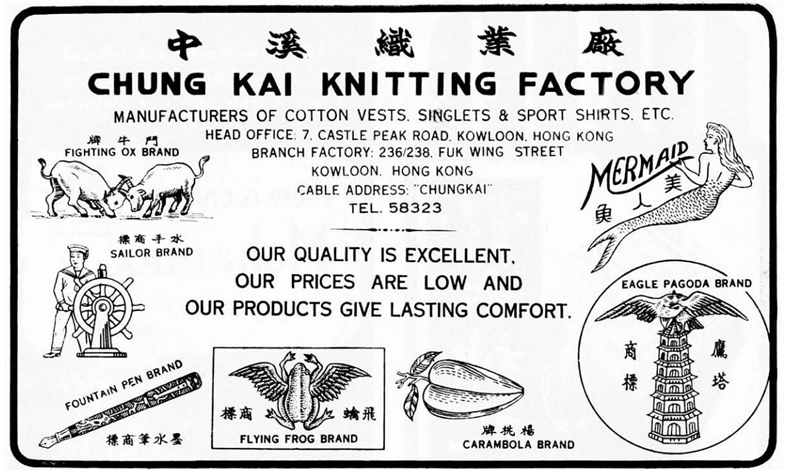 In December 1935, he founded Chung Kai Knitting at 60 Tai Nam Street in Shum Shui Po to manufacture singlet and registered the trademarks of Eagle Pagoda, Flying Frog and Fighting Ox brands of singlets and shirts in 1939. By 1941, the firm had 240 workers. During the Japanese occupation, production at Chung Kai was suspended but resumed 5 months after liberation at 7 Castle Peak Road. By 1948, the new plant had 40 sewing machines and production was at 300,000 dozens per month with export markets such as Malaysia, Indonesia, Thailand and South Africa being its main markets and business was somewhat difficult given the challenges in these markets so the number of workers was only 105 (less than half of pre-war number), 15 male (monthly salary of $400 each, 8 hours per day) and 90 female. In the early 1950s the firm like most other factories in HK at the time experienced labor issues and has to lay off 40 workers in 1952. By the mid-1950s however, business was booming with lots of business coming in from Malaysia and a branch factory was established in 236-238 Fuk Wing Street in Kowloon. In 1962, 40% of Chung Kai’s products were exported to the UK while the Singapore and Malaysian market represent another 40% and the remaining 20% came from the rest of the world. The same year, the firm invested HK$2 million to build a plant in Petaling Jaya in Selangor, Malaysia by sending over 50 workers from HK and recruiting 250 workers locally. Lun was supported by his younger brothers Lun Man-to (倫文韜) and Lun Man-kit (倫文傑) at Chung Kai. Outside of Chung Kai, he was active in industry groups and served as chairman of the HK Chinese Textile Mills Association (華商織造總會, founded in 1931) and director of the Chinese Manufacturers Association. (Chung Kai had participated in CMA’s HK Products Expo though not a very active participant like some of its competitors). 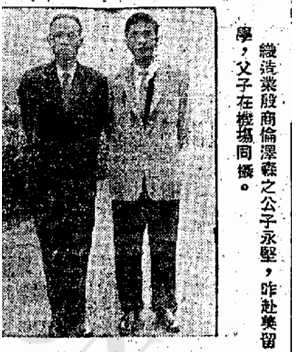 In 1963, his daughter Lun Lai -wah (倫麗華) married Joseph Wong, son of Wong Mee of Sweetmart Garment Works (see article), linking the families of two major players in the HK garment industry. In January 1976, Lun Chak-sum died in Hong Kong and was buried in the HK Catholic Cemetery. His eldest son Lun Wing-kin (倫永堅) took over and by the 1970s the firm had shifted its production and marketing focus to Malaysia. Wing-kin ran Chung Kai Knitting Factory Sdn Bhd in Malaysia and was one of the founding directors of the Malaysian Knitting Manufacturers Association in the late 1970s. The most famous member of the second generation of the Lun family however is Anthony Lun (倫永亮, 1957-), HK songwriter and singer who is best known for his collaboration with Cantopop stars such as the late Anita Mui and Sandy Lam. In August 2003, Lun Wing-kin and Lun Wing-keung (倫永強) sold the family residence at 7 Magnolia Road in Yau Yat Chuen for HK$36 million. This article was first posted on 6th April 2018.